China Mobile recently completed the commercial verification of LTE TDD inter-band 3CC Carrier Aggregation (CA) using Huawei's commercial base station and Qualcomm Technologies’ commercial terminal based on the Qualcomm® Snapdragon 810 processor with X10 LTE. [Shanghai, China, May 19, 2015] Huawei and Qualcomm Technologies, Inc., a subsidiary of Qualcomm Incorporated, have jointly announced the completion of tests using LTE CAT11 terminals. ZTE has announced successful demonstration of time-division long term evolution (TD-LTE) downlink three-carrier aggregation (3x CA) in collaboration with China Mobile and Qualcomm Technologies. Qualcomm today announced that it has a growing customer design pipeline in excess of 60 mobile devices based on the Qualcomm Snapdragon 810 processor. New devices based on Snapdragon 810 include the LG G Flex2 and the Xiaomi Mi Note Pro, with many more expected in the coming weeks and months. Nokia Networks and Qualcomm have completed interoperability testing of LTE-Advanced three-band Carrier Aggregation (3x CA) to achieve subscriber data rates of up to 300 Mbps in network environments. 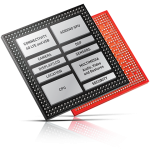 Qualcomm has announced that its Qualcomm® Snapdragon 200 tier, the Snapdragon 210 processor, will offer integrated multimode 3G/4G LTE and LTE Dual SIM for entry-level smartphones.